It’s hard to believe it’s been a little over a year since I jogged 40k on my 40th birthday. It was such a profound day for me. A day that took one day after the other to achieve. How many times in my past had I felt like that? Countless times! I had felt sad, depressed, fearful and stuck. I wasn’t enjoying my life; I was just existing day to day. She was now faced with the possibility of cancer. Instantly her life became important and worth fighting for and instantly she became unstuck and realized she now has a second chance. We all have second chances if we take them. Don’t wait for an illness, accident or some sort of loss to shake you out of it. Do something about it NOW because it’s YOUR life and therefore YOU can make the CHANGE. Jogging 40k last year was my second chance and I am forever grateful for that decision. So often people lie about their age or try to forget it’s another birthday. I want to CELEBRATE! So, although this year I’m not running 41k, I am celebrating another goal. Today I am officially launching my website! For me, this goal is an extension of the 40k goal, only now I can share my experiences and what I’ve learned along the way. My intention for this website is through the telling of my personal journey, I can help someone with theirs. It’s truly as simple as that. A marathon is 42k. At the time of my 40th I did not want to do 42k…I wanted to do 40k. YES!! 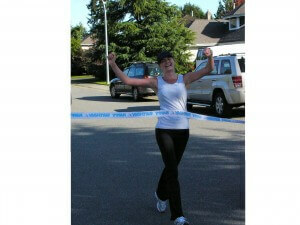 I have decided to run a marathon on my 42nd birthday! The difference this time is I won’t be training alone. I am going to bring YOU along for the ride…the bumpy, bitchy, happy, joyful, aches and pains ride of the training, food and all the emotional stuff too…lucky you!!! I will also have my wonderful friend and partner in crime coaching me. Jody Kennett from Leapfit will whip me into better shape by putting me on a cross training program, an excellent running program and help me achieve my marathon goal. I will not have to do this alone this time and I AM SO EXCITED!! So, to make myself accountable I, Tina Moore, will jog 42 kilometers, a full marathon, during the month of my 42nd birthday. I would love company if you are interested in running with me…you don’t need to do the entire distance, I will find a marathon that also offers half marathons and 10k routes…so there is a level for everyone. You have one year to train with me…we can do it together…it’ll be far more fun…. 42 at 42 – what a fabulous idea. When you find out where the run is going to be, I will be there to run the 1/2 with you and then cheer as loud as I can for the rest. At the end I will have Starbucks waiting for you. Congratulations Tina on the first year of 40 and the goals you have set. Can’t wait to be part of it with you. 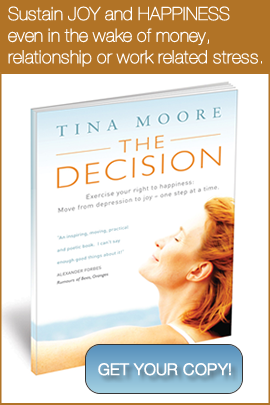 Congratulations, Tina, on the launching of this wonderful website that will inspire so many, myself included! Setting goals and reaching them is a wonderful thing . . . sharing them on a blog is even better. Congratulations. May the choices you are making come to fruition. Congratulations! love and miss you.Keep in touch. Hi Tina. I am giving you my comitment to living a better life. My journey starts now. I planted two shrubs today, one is in honor of you and one is in honor of me. We will watch it grow, change, go through stresses and still reach for the light. They are also growing next to each other for support. I am going to face this surgury head on with my chin up and look forward to the recovery. thank-you my friend. love jan jan.